Join us for one of two free screenings of Making a Killing: Guns, Greed, and the NRA and discussions to learn about ways you can stand up against the power of the NRA. Louisville native and Brave New Films Campaign Organizer, Elizabeth Sawyer, will answer questions about the film. ​Making a Killing: Guns, Greed, and the NRA tells the personal stories from people across the country who have been affected by gun violence, including survivors and victims' families. The film exposes how the powerful gun companies and the NRA are resisting responsible legislation for the sake of profit. The film looks into gun tragedies that include unintentional shootings, domestic violence, suicides, mass shootings and trafficking - and what we can do to put an end to this public-health crisis. Join us and learn what you can do to fight for a country where public safety is more valued than profit. 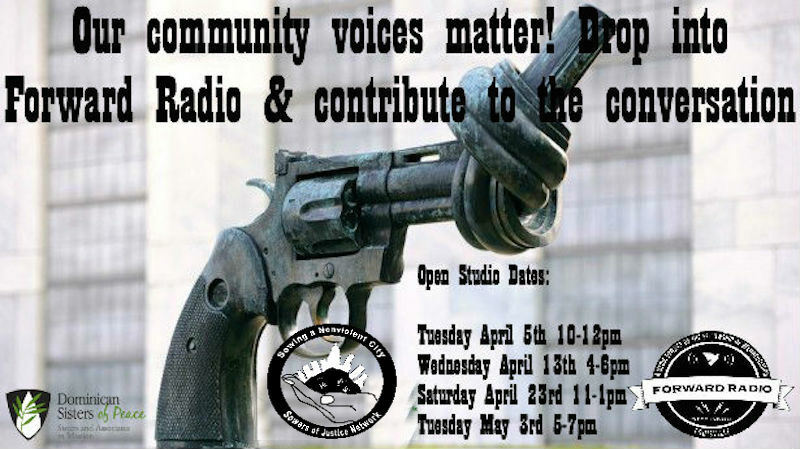 This activity and others are being planned to coincide with the Festival of Faiths http://festivaloffaiths.org and annual meeting in Louisville of the NRA.The artist is Mike Martin, founder and Executive Director of RAWtools, Inc., a nonprofit group that transforms weapons into hand tools. RAWtools’ work has been seen in the Huffington Post, New York Daily News, Red Letter Christians, Sojourners, Edible Vineyard, and others. Mike will be working from 12pm-2pm and 4pm - 6pm Wednesday through Saturday, May 18-21. His work station will be on the Plaza in front of the American Life Building, 471 W. Main Street, Louisville. We need for 2-4 people for each time slot Wednesday-Saturday to interpret the work being done and to invite people to further action and connection. For more information or to donate a gun for the project, please contact Doug Lowry at sowersimpact@gmail.com with questions or sign up for slots to work HERE. Lil Hands Lil Feet Gun Safety Program Graduation on May 19th, 6PM Louisville Free Public Library, 4th and York. Gun safety and violence prevention, No More Red Dots Campaign. Sponsored by Board 4 Change. March/Pilgrimage to Moms Demand Action Vigil and Film Screening. Christ Church Cathedral 421 S 2nd to Spalding University , 812 South 2nd Street, College Street Ballroom (Formerly The Kosair Ball Room). 8:30 a.m. Strong walk, march, pilgrimage starting at Christ Church Cathedral 421 S 2nd S and ending at the Spalding event at 10 a.m.
11:00 a.m. Screening the film Under The Gun Screening and panel discussion to follow. Event will conclude by 1:30 p.m. This year in Kentucky, supporters helped shut down the NRA's dangerous agenda. So how are we celebrating? On Saturday, May 21 -- the same weekend as the annual NRA convention -- Moms Demand Action will gather in Louisville for a special screening of the film, "Under the Gun," which explores the issue of gun violence in America. Moms has a limited FREE tickets available and we hope you will join us in celebrating our huge win over the gun lobby in Kentucky this year. Additional Details: Once you RSVP, an organizer will call you with the exact location and more details. ​RSVP will be required for the film screening. No Guns in God’s House, Presbyterian Peacemaking Program. The event will have music, prayer and words from Tony De La Rosa the Interim Executive Director of PMA Steps of PCUSA, 100 Witherspoon Street. Festival of Faiths Event, with support from Sowers of Justice. Compassion Walk which will close out the Festival on Saturday, May 21 at 4:30pm. We will be walking from Actors Theatre to the Riverfront Festival Plaza for the dissolution of a sand mandala and the forming of a human enso (the Festival's logo). Be a part of the solution as we stand as a community to stamp out gun violence. Holding hands, dancing, singing, spoken word, storytelling, vendors and much, much more!! Come and be a part of history and hear true life stories from our children and survivors of the gun violence. June 2 - Wear Orange Day 2016. National Gun Violence Awareness Day. Mark your Calendars. Moms Demand Action and Louisville Urban League. Details forthcoming here. ​ Answer the quick four questions about YOUR experience with guns and gun violence-HERE. Creating an Artful Presence for Peace and Nonviolence for your Congregation or Community! ​See our Community Art and Banner Making events above, May 9 and May 14th.